The off season is officially here for me. Our baseball stories obviously die down during the fall and winter months. I will be picking up the Cael’s Collection features to share some of the baseball cards of Cedar Rapids professional baseball players that I have picked up. This morning’s selections are a trio of Jared Abruzzo cards. Abruzzo played in Cedar Rapids in 2001 and 2003. He was a second round draft pick out of El Capitan High School in Lakeside, California by the Los Angeles Angels in the 2000 MLB draft. 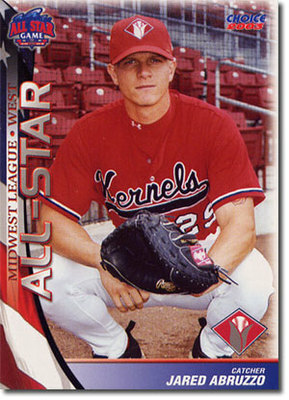 Abruzzo hit .241 with 20 doubles, 10 HR and 53 RBI in 87 games for the 2001 Kernels squad before earning a promotion to Rancho Cucamonga mid-season. The 2001 Kernels finished fifth in the West Division of the Midwest League with a 60-77 record under manager Tyrone Boykin. Jared Abruzzo returned to Cedar Rapids for the 2003 season where he hit .271 with 30 doubles, 13 HR and 73 RBI in 130 games. Abruzzo was selected to the Midwest League All-Star squad. The Kernels posted a 66-72 record under the guidance of Todd Claus to finish in fifth place in the Midwest League’s West Division. 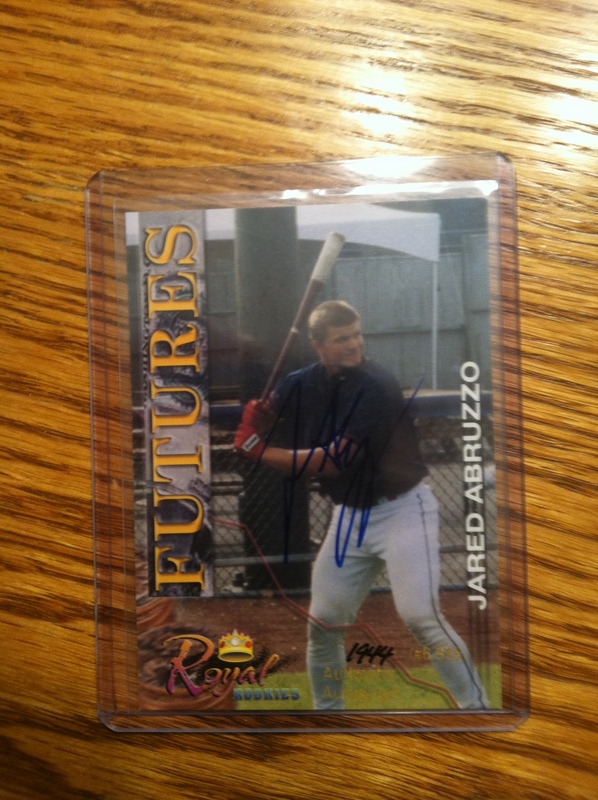 Jared Abruzzo played his final season in the Angels organization with the Rancho Cucamonga Quakes (Hi-A) in 2004. Abruzzo then split a season playing for the Bakersfield Blaze (Hi-A) and the Frisco RoughRiders (AA) in the Texas Rangers system. He served as a varsity assistant coach at El Capitan High School in 2012. Abruzzo coaches the East County Pirates travel-ball team as well. 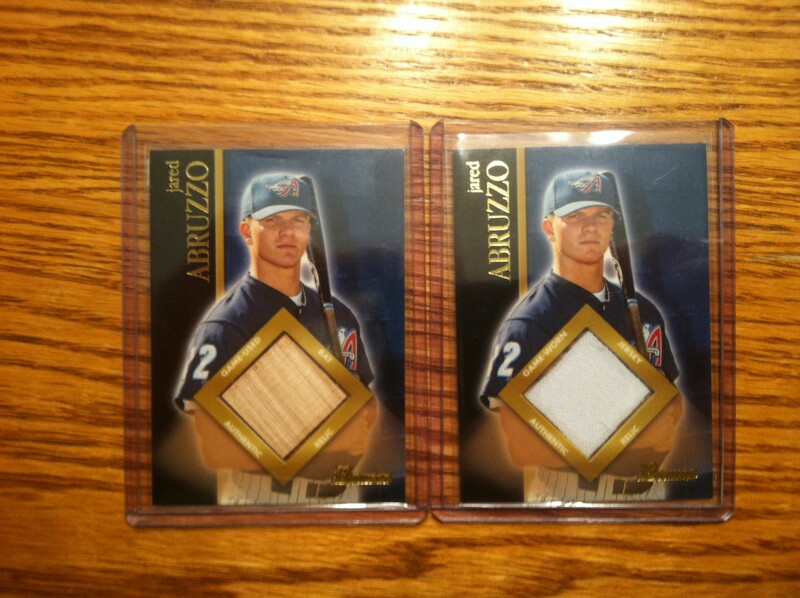 I have picked up a pair of relic cards from the 2002 Bowman set and an autographed card from the 2001 Royal Rookies set of Abruzzo. The relic cards are numbered BR-JA1 and BR-JA2. The game used bat card was one of the earliest to feature a minor league player. Theses cards are usually available for $5 or less on Ebay if you are willing to wait with the bat showing up less often than the jersey card. The Royal Rookies autographed card is serial numbered 1944/6995 and also can be picked up for $5 or less delivered to your door. There is a 2001 Bowman certified autograph card of Abruzzo that I have not picked up yet, but that is about the only other relic / autograph card I have seen listed.